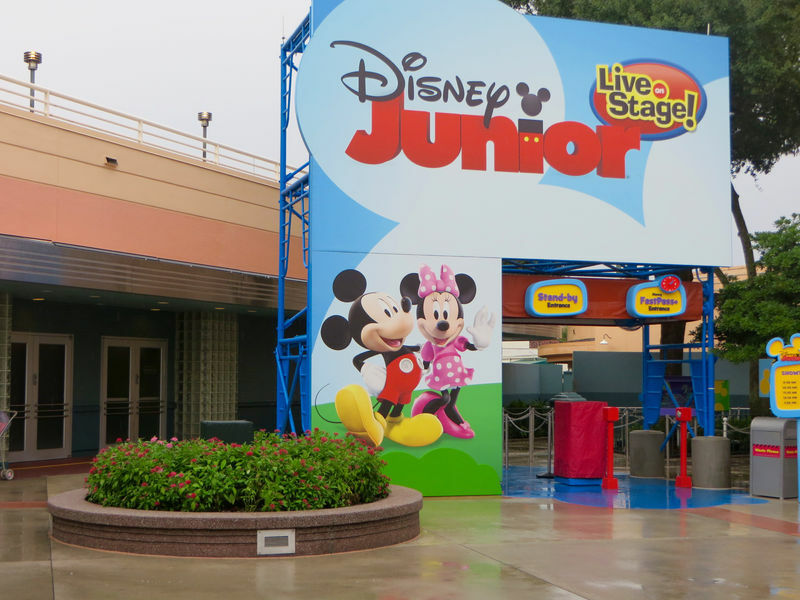 MousePlanet Park Guide - Walt Disney World - Disney Junior - Live on Stage! Disney Junior - Live on Stage! is a live stage show of the Disney Channel's block of preschool television programs. Mickey and his pals from Mickey Mouse Playhouse are planning a surprise birthday party for Minnie Mouse, but need a little help hanging the decorations, baking a cake and writing an original birthday song for the party. They turn to Casey, the show's live host, for advice, and she suggests that they might get some inspiration from some of their favorite stories. That's the cue for the characters from three additional Disney Channel shows to take the stage and help out. Characters from Sofia the First, Doc McStuffins, and Jake and the Neverland Pirates perform on stage, while children are encouraged to sing and dance along with the show. Location: To the right after you enter the Animation Courtyard. # of Shows: At least 10 shows per day, approximately once every hour. Characters: Mickey Mouse and characters from the Disney Junior shows mentioned above. Photos and Autographs: None in the show, although characters appear in an area outside the theater at various times during the day. Wait Times: Generally if you are there before a show starts, you'll get into it. If your child wants to sit right in front of the stage, though, you may want to get there as early as 30 minutes ahead of time. Health Restriction: None, but if you have a hard time sitting on the floor you should seek out the benches along the wall. Ride Access: The theater is wheelchair and ECV accessible. Audio: Assistive listening devices and reflective captioning devices are available for this show from Guest Services. Weight and Size Issues: Guests must sit on the floor or wall benches during the show. At this location: This location has actually had a zoning change since the park opened in 1989; it was originally a restaurant. The Soundstage Restaurant opened with the park, and the concept was that diners were in the middle of a movie soundstage. By the time the restaurant closed in November, 1998, it been the soundstage for Big Business, Beauty and the Beast, and Aladdin. Needless to say the idea that it was a real soundstage had slipped a bit since those last two wouldn't have had real soundstages. On June 7, 1999, the space reopened as a stage show based on the Disney Channel's Bear in the Big Blue House. This show lasted about two years, closing in August 2001, and the current show was designed to add more from the Disney Channel lineup. The Attraction's History: The show characters have been updated since it opened in 2001. Originally the show featured Bear in the Big Blue House, Rolie Polie Olie, Stanley, and The Book of Pooh as they tried to help Tutter get over his shyness. The show previously featured Handy Manny and The Little Einsteins.